Welcome to the Monastery of Alt-Wittendorf in Wittenberg, home of Brother James .. Brother James has just arrived back and is conversation with the Abbot .. The preceding day had been very wet and both sides had had great difficulty moving their artillery trains due to the muddy roads. The Wittenberg Army started across the river at Wollen aware that Monrovian troops had been seen by scouts in the town of PikaStrudel. The Wittenberg troops crossed the bridge and deployed slowly, the Field Marshal was being unusually cautious, he had no artillery to use and wanted to get across the river safely and in good order. He had his suspicions this looked too easy.. Where were the Monrovians ? General von Stricknein had taken the main body of his forces back to their main camp, but left some troops to monitor the river crossing. He had them encamped to the west of Pikastrudel, out of sight of the river crossing. Von Rootsbeer hearing from his scouts that the enemy had crossed the river, ordered them to break camp and march post haste to the positions already allocated to them. The Wittenberg Fusiliers moved forward to take on the Monrovians; the Monrovians gave a fierce volley in reponse to an ineffective volley from the Fusiliers. The Fusiliers broke and ran. Up came the next Wittenberg battalion, again their volley was ineffective and Monrovians gave a fierce volley in reponse. The Wittenberg line battalion held their ground, but casualties were mounting .. The attacking infantry were taking too many casualties. The Field Marshal ordered the withdrawal, saying to the King - Your Majesty we must retire, we won't get anywhere without artillery.. The King of Wittenberg was disappointed, he had wanted to capture Pikastrudel. The Field Marshal was not happy, the Wittenberg infantry had been a unstable, musketry was poor - there was more work to done yet before they would be ready for a major battle. The Monrovian commander was pleased, he had held off a large force and taken few casualties. He wasn't happy though at losing the pontoon bridge equipment. Where were those three dragoon regiments who had persued him ? He hoped they had gone home. What the Monrovian commander didn't know was that the three Dragoon regiments had crossed the river under cover of darkness and were on their way to raid a important Monrovian military target. The Wittenberg dragoons shadowing the Monrovian withdrawal from GugenStadt, met up with two regiments of cavalry sent by the King to attempt to block the Monrovians from reaching their river crossing at Wollen. without a response gathered his troops together and moved to cross the river at Wollen. His aim to capture the small town of PikaStrudel. His intention was to use it as a base of operation for further strikes into Monrovia. [Figs: French Napoleonic Guard Bands: Mounted band - converted Mirlton Miniatures Foot Band - Minifigs]. Some extra mules and some pack horses, (Figs: Irregular Miniatures) . The Duchy of Fenwick artillery, just arrived at Tippelbruder, get some practice in. [all figs are from Irregular Miniatures, 25mm Marlburian range]. Some Irregular Miniatures 42mm Prussian Artillery and some other converted figures portray some Hesse-Kassel artillery. The Royal Society of Wittenberg met for the first time today, in the gardens of at the King's summer palace. They extend their fraternal greetings to all scientists, philosophers etc of Europa and hope to establish ties with similiar groups in other countries. Brother James of Alt-Witendorf, historian, geographer and amateur astronomer. Shown here demonstrating how to view the moons of Saturn (obviously he has been at the sherry again - the abbot will surely displine him when he gets back to the abbey). 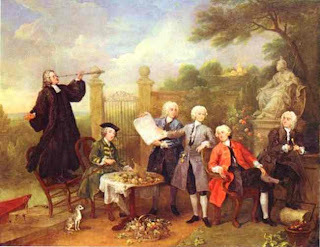 Augustus FinkNottelot (at the table), philosopher, who treatise 'When is Now ? or How What is Where' is well known. Heinrich Furbusten, Natural Philospher, specialist in agriculture, whose is currently publishing his rather complex crop rotation system. Johann Jungmann, Chemist - often derided for his alchemical researches. He always seems to look very youthful - he says it is down to a healthy diet and good exercise, following a regimen laid down by his distant relative the Count de St Germain. Gunther Doppelganger, Mathematician - known for his work on the alegbra of dual sets. Georg Cantor, Natural Philospher - whose Study 'On Song Birds' is widely read.